This was in 2005, when the NGMA hosted a huge retrospective show of the artist. At that time, the art market was at the cusp of record-breaking sales. No one knew of the mindboggling commercial successes that lay ahead. So art journalists just stuck to speaking about art, and not the market. The curator of the show was Ranjit Hoskote, whose ‘young’ age and deep understanding of art Sabavala couldn’t help but refer to throughout the evening. To most people, Sabavala’s style was predominantly Cubist—where the subject in the painting is shown as randomly angular and geometric, a style made famous by Pablo Picasso. But Ranjit strongly feels that the tag of Cubism has restricted us from appreciating the brilliance of Sabavala’s art. “Sabavala was not attracted to the ideological content of Cubism, which was about a revolution against the stasis of bourgeois society and its smug academic art. Sabavala was more interested in Cubism’s discipline in form, which helped him appreciate the play of light and structure,” says Hoskote. When the art market scaled new peaks in 2006, the prices of Sabavala’s works went up too. Even though they never broke any industry record or topped any list, the prices were an unprecedented elevation marker in his career. 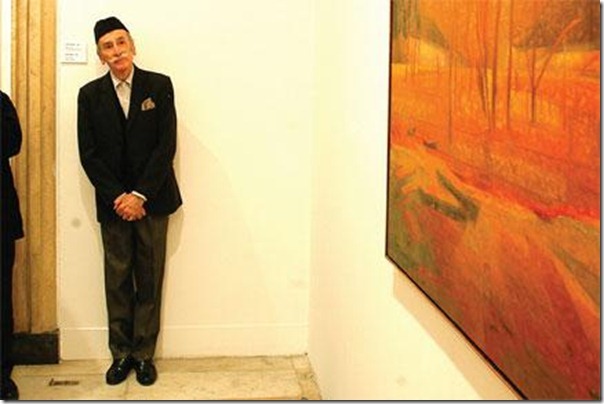 In 2010, a painting called Casuarina Line fetched Rs 1.7 crore at a Saffronart auction. And this year too, Saffronart placed great importance on two of his large landscapes, The Inland Seas II and Flight of the Cranes II, which went under the hammer on 20 September. But one must remember that all this market hype and success didn’t push Sabavala into an accelerated drive to produce new works. He maintained that dignified calm and pace which was always an essential part of his personality. Born in 1922 to an affluent Parsi family in Mumbai, Sabavala’s career spanned more than six decades, and he was awarded the Padma Shri in 1977. After battling lung cancer for the past two years, he succumbed to respiratory failure last month. His Westernised image and lifestyle was in total contrast to his works. And for that, he was often misunderstood as being disconnected with India. He discovered his love for painting at the age of 23. Having studied art in Paris and settled in England for a while, it is actually because of his love for India and yearning to understand it better that he returned in the early 1950s. “Very few know that he had extensively travelled across India, spent time at the Munger ashram and was a deeply spiritual man. And how can you miss the Indian colours in his canvases that were full of browns, ochres and reds? He saw himself as a pilgrim. And perhaps that’s why he never belonged to any clique or club like the popular Progressive Artists’ group of the late 1940s, which included masters like Souza, Raza and Husain,” says art critic Ina Puri. It is this individualism that has also come to define Sabavala’s style best. He is the artist who will always be remembered for bringing Cubism to the landscape of Indian art. Cubism, that is, with a twist.